If you’ve recently had a portrait session with Brian Pasko Photography, you’ve had a unique experience you will remember for a lifetime. I want to make it as easy as possible for you to beautifully display and enjoy the images that we produced together. As a result, I offer a wide range of heirloom quality prints and products that your family will love and that will last for generations. Below are examples of our most popular products. Please contact me for my complete product and pricing guide. Canvas gallery wraps are ideal for rooms where you want to combine a classic texture with a distinctive artistic look. These museum quality 1¼” canvass wraps come ready to hang. Every frame is built with a solid face to support the canvas, which keeps the print from deforming or loosening. 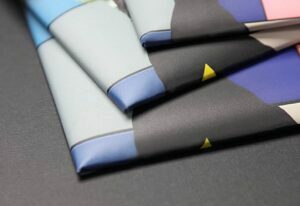 The result is that, unlike other canvas products, your canvas will always look as tight and flat as the day it was made. Pigment based inks are used for exceptional fade resistance and every canvas is finished with a clear acrylic coating that provides a scratch resistant protective layer with a satin luster. Many sizes are available ranging from 5”x7” to 32”x48”. Canvasses can also be custom framed to provide an optional more modern look. Quantity discounts are available for canvas wall groupings. Please inquire for price and availability. Give your image a soft three-dimensional look with this padded print wrap. 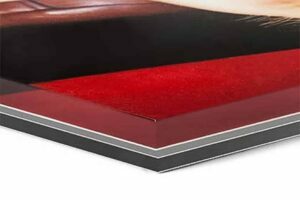 Your print is coated with a satin laminate and then wrapped around a soft foam layer. A mounting block is affixed to the back for hanging, which makes your print appear to float on the wall. Or, choose a wooden easel for tabletop display of images up to 12×30. Many sizes are available ranging from 5”x5” to 24”x36”. Quantity discounts are also available for wall groupings. Please inquire for price and availability. 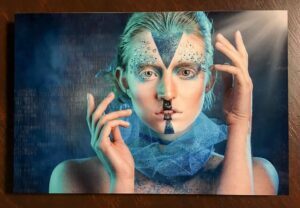 Metal prints give your portraits a unique and modern look. Dyes are infused into (not on) specially coated aluminum sheets, making your image appear stunningly vibrant. Metal prints come standard with a hanger designed to float the print ½ inch off the wall. Choose either square or rounded corners. 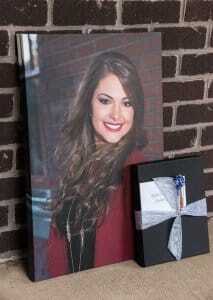 This is an especially popular product for high school seniors and children’s portraits! Metals can be created in a wide variety of sizes as large as 48”x96”! Quantity discounts are also available for wall groupings. Please inquire for price and availability. Nothing says “luxury” like an image embdedded in a sheet of glass! Acrylics are beautiful photographic prints face-mounted to ¼ inch non-glare acrylic with polished edges. The professional grade acrylic enhances colors and will make the details in your image appear even more crisp and clear. Behind the print is a dibold aluminum sheet that provides sturdy support to the display. Each acrylic is completed with a cleat hanging system, making it easy to mount the acrylic on your wall and keep it level. Acrylics can be created in a wide range of sizes from 4”x4” to 43”x96”. Please inquire for price and availability. Make your images literally stand out! A luster photographic print is mounted on a ¾” thick lightweight backing available with black, white, brushed stainless, or maple finished edges. These mounts give a contemporary look to unframed images and come with a mounting keyhole in the rear for easy hanging. Standouts are available in 21 different sizes ranging from a 4”x5” gift print to a large 30”x40” wall display. Call for price and availability. People have been framing printed images for centuries because frames and mats add beauty and value to your finished portrait. Our standard framed images include a luster print surrounded by a double-mat and a beautiful wood or metal frame. The print is mounted on thick foam core for support and then protected by a clear acrylic sheet (indistinguishable from glass). Finally, the display is finished with a black paper backing and a wire hanger, ready to be exhibited on your wall. There are over 45 frames to choose from including classic wood and metal moldings, frames made of barn wood, and gallery inspired frames. A double-mat allows for an accent color that will draw the viewer’s eye into the framed portrait. With 13 mat colors to choose from, and a wide variety of available sizes, the ability to personalize your framed print is almost endless. But there’s no need to be overwhelmed! We have a range of design tools and the expertise to help you quickly and easily customize a framed print that it will complement and enhance your home. Beware, these are no ordinary photographic prints! 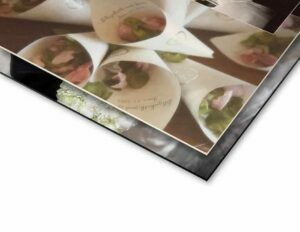 Each heirloom quality gift print arrives mounted on a thick and durable styrene base ready for framing. Or, use one of our classic wooden easels to display your prints on a shelf or mantle. Our mounted gift prints are made with fade-resistant inks and enduring archival quality papers. They will never bend or curl and are guaranteed to stand the test of time. 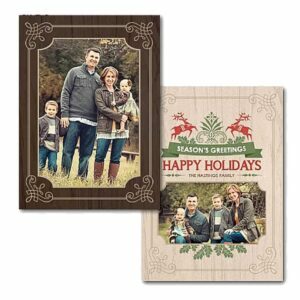 Gift prints come standard with a luster finish (recommended for portraits) and a premium protective coating that resists fingerprints, scratches and other damage. 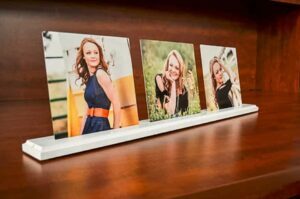 PhotoShelfs complement almost any decor and are a versatile way to display your favorite images in your home or at the office. Each PhotoShelf comes with three mounted prints that sit in a solid black or white wood base. PhotoShelfs come in two sizes. The 24” shelf is perfect for a desk or small space and is designed to hold three 6”x6” mounted prints. The larger 30” shelf is great for a larger shelf or fireplace mantel and holds three 8”x10” mounted prints. PhotoShelfs make great gifts! And you can order additional prints and give your shelf a fresh new look anytime you like! Sit back and relax! We do all the work for you with our custom design service! And, unlike typical books, our product has a unique binding that allows pages to open and lay flat without any gutter or unsightly seam to separate the pages. Every two-page spread is a single unbroken sheet of premium archival photographic paper with nothing in the middle to interrupt full image spreads except for the page fold. Your images are printed on silver-halide archival photographic paper with a luster finish that provides fade-resistant colors, realistic flesh-tones, and amazing detail that you can’t get with other press-printed books. Each book begins with 5 spreads (10 pages) and additional spreads can be added. A well-designed book typically contains between one and three images per page. Signing books have one or two images per spread, providing plenty of room for love notes from friends and family. Most high school seniors and families enjoy a book that is between 5 and 10 spreads (10–20 pages). Choose from a leather-lux, linen, or custom hardcover. 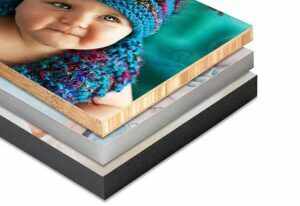 Layflat books are available in 8”x8”, 10”x10” and 12”x12” formats. And an identical 6”x6” gift book may be purchased as a discounted add-on to the purchase of any book. Our premium albums set the standard for beauty, durability and style. Built to last, each handcrafted album features thick pages with rounded corners and gilded edges that will never bend or curl. A full leather or lux-leather debossed cover provides a classy and sophisticated look. Each album begins with 5 spreads (10 pages) and additional spreads can be added. 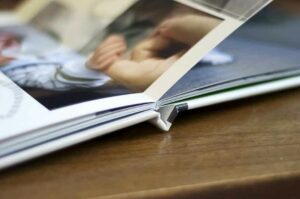 A well-designed album typically contains between one and three images per page. Signature Albums are available in 8”x8”, 10”x10” and 12”x12” formats. And an identical 6”x6” lay flat gift book may be purchased as a discounted add-on to the purchase of any album. Our professionally designed cards are the perfect way to send holiday cheer, celebrate your graduation, or announce an important lifetime event! All of our cards and announcements are printed on thick 130# semi-gloss cardstock and arrive with accompanying white envelopes. Our standard cards are size 5”x7 and can be designed as flat announcements or folded greeting cards. Both styles are available in sets of 25 with a minimum order of 50 cards. Each order includes our custom design service. After discussing your preferred style and goals, you will be presented with 2-3 custom layout options from which you can choose your favorite design. We will then go through up to two rounds of additional review and feedback to ensure you are happy with the results before printing. The digital media section of this product guide demands a prelude; because I have a passion for printed photographs and I want to share that passion with you. I believe I have a sacred obligation; a responsibility to not just to create beautiful portraits for you, but to preserve those images for your children and grandchildren. 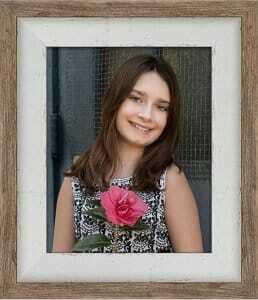 A digital file is always at risk of becoming corrupted or lost, and a printed image is the only way I can help you guarantee that your portraits will become precious heirlooms for your family’s future generations. Moreover, the beauty of your images can never be fully appreciated on a computer screen. It is unlikely that you will ever pull out a hard drive of photos to share with guests at a holiday gathering. And an electronic image holds no comparison to a finished portrait that was carefully designed to be displayed exquisitely as artwork in your home. High resolution digital images are provided as jpg files that have a resolution of 240 pixels per inch and are suitable for making prints up to 8”x12”. The images are provided to you via a digital download and include a release that authorizes you to make prints at a lab of your choice for personal use. Please understand that our studio cannot guarantee the quality of prints that are not produced through our chosen professional print labs. Also be aware that while retouching is provided at no charge for printed products, retouching is not included with an order for only digital files. Mobile albums are custom designed cell phone applications that can be installed on any smartphone. It is a simple and convenient way to carry your portraits with you wherever you go and show off your favorite images! Each cell phone app includes up to 20 images that you select. 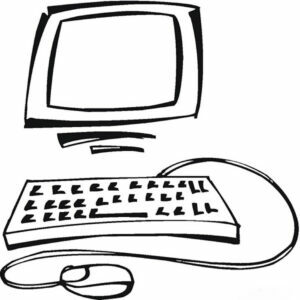 The app can be shared and transferred to other friends and family members, and does not require an internet connection once installed. Set your images to music and view them cinematically with a custom designed digital slideshow! The length of the show varies, depending on the number of images chosen, and the video is provided to you in mp4 format as a digital download. The slideshow can also be provided on a custom designed USB Drive or DVD at an additional cost.